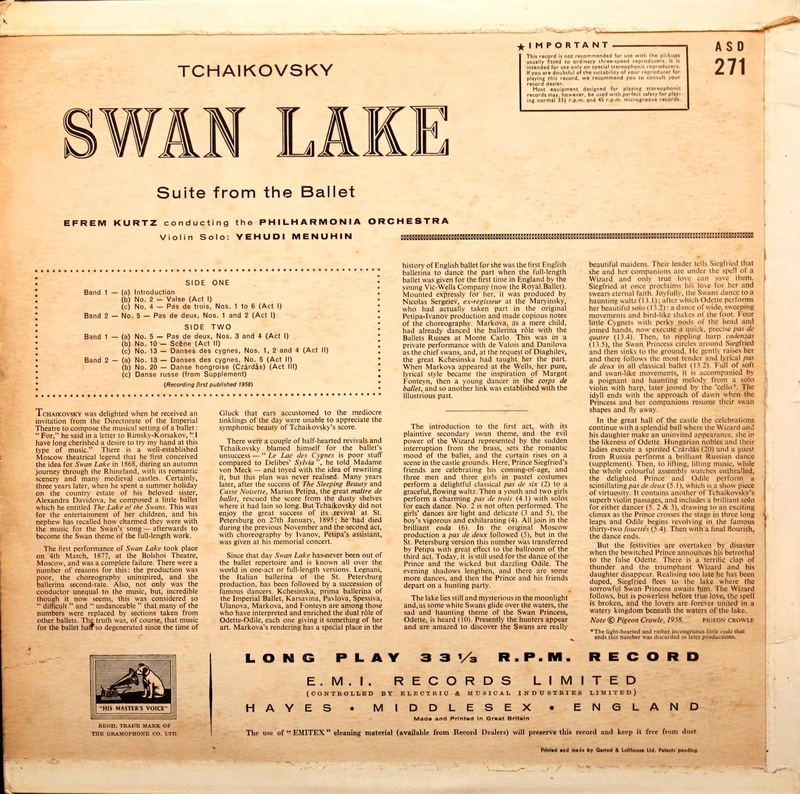 Comments: Without a doubt, the Tchaikovsky ballet recordings of Efrem Kurtz and the Philharmonia are hands down my favorite of both the analog and digital eras. This one is no exception. Not surprising, considering that Kurtz was the conductor of the Ballet Russe de Monte Carlo from 1932 to 1942. I was interested to learn that he became an American citizen in 1944 and subsequently was named the music director of both the Kansas City Philharmonic (1943-48) and the Houston Symphony (1948-54). 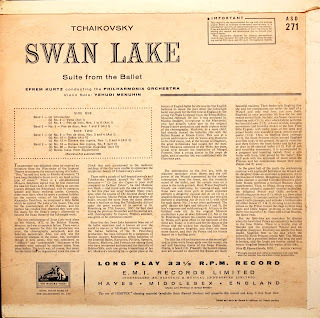 From 1955-57, he was the music director of the Royal Liverpool Philharmonic. He passed away as recently as 1995 at the ripe old age of 95. These performances are full of vitality and charm and are blessed with excellent, warm, "tubey" sound. That is another reason I love these Kurtz records. They've got great sonics. Dynamic range is wide, and you can appreciate the acoustics of the recording venue. In addition, the violin solos are performed beautifully by none other than Yehudi Menuhin. 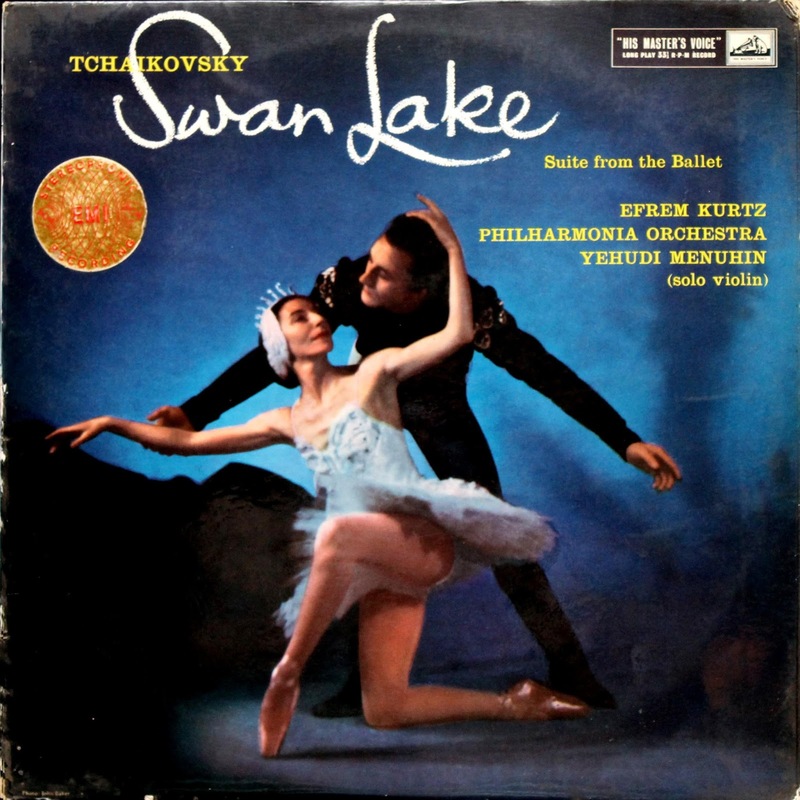 These Kurtz ballet recordings don't generally sell for a lot of money on Ebay. Pick them up while you can! My copy of this record is a semi-circle second pressing, and I see no sonic deficiencies with it. We have SLS859 and CFP 40296 for those who are very cheap, but why would you when the pressing under review can be had for $10. I'd say that this is a candidate for ten best buys as the gold and cream NM copies have been selling for around $45 lately. 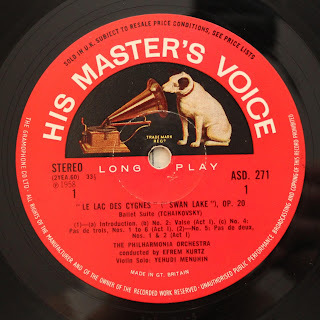 I will have to acquire all three ASD pressings (color stamp, G&C, and this semi-circle) for the sake of comparing. No surprise to me that the second pressing has garnered a 5 for sound. The second pressing on ASD is great, while the similar looking SAX pressing is a mixed bag at best.